On April 23, 1923, Mary Emery pushed the famed silver shovel into the ground at a spot opposite the tennis courts, thus officially beginning construction of Mariemont, Ohio. Whether you have lived here your whole life, are new to the Village, or simply a first time visitor, the unique landscape and rich history characteristic of Mariemont is something that often resonates with all. Although Mariemont seems like a place torn from a page of history or whimsically recreated from a Norman Rockwell painting, much was involved in the process of bringing Mariemont to fruition. For more than fifteen years prior to its initial construction, Mariemont’s founder, Mary Emery meticulously acquired land and spent upwards of seven million dollars in the development efforts for the “national exemplar” town. Her ultimate vision for the project was to create a place where people of all income levels could reside, whether seeking quality rental property or purchasing single-family homes. The project became the costliest venture of Mary’s life and remains the most significant testament to her altruistic concern for community and her devotion to human welfare. This month marks the 90th anniversary of both the official announcement of the Mariemont project to the public as well as Mariemont’s festive groundbreaking ceremony. Although known for her many philanthropic endeavors throughout Cincinnati, Mrs. Emery was very much a private person. 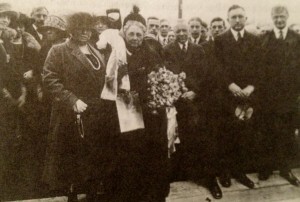 Nonetheless, Mariemont’s ceremonious inauguration in the spring of 1923 saw one of the nation’s wealthiest women thrust into the local limelight, as both Cincinnati newspapers and hundreds of people joined Mary with her silver spade in one hand, and a bouquet of roses in the other. Her nurse stands close by, as Mrs. Emery was not well, and in fact, died four years later. Turning the first piece of Mariemont’s soil with the silver spade, Mary was filmed by a cameraman from Pathé News. To this day, the Pathé News film is the only live footage known to contain Mary Emery. Fortunately, the film has been made available through the Mariemont Preservation Foundation and can be accessed by visiting their site at www.mariemontpreservation.org. After Mary used the spade to overturn Mariemont’s first piece of soil, a three-foot granite shaft was placed at the site where the shovel broke ground. This granite shaft continues to rest at the site of the Ferris House on Plainville Road, which served as the Mariemont Company’s field headquarters, and made for an appropriate backdrop for the event. Today, the silver spade used by Mary is on display in the Village’s municipal building. As anyone can see by walking or driving through the neighborhood, our Village continues to change as new ground breaks throughout Mariemont. Whether it is the recent completion of Mariemont Elementary School’s new facility, the groundbreaking of Nolen Park condominiums, or the addition currently underway at the Mariemont Theatre, Mariemont continues to evolve, serving both the renters and owners of private family residences, which Mary Emery had originally envisioned to cater to. While it is easy to look around and see these changes happening before our very eyes, it is both important and humbling to look back on the groundbreaking of the Mariemont project ninety years ago, and reflect on the success of Mary Emery’s great gift to us all. The new town of Mariemont was a project that ushered in the successful experiment of providing new housing for various income levels, when an alternative to congested city living was much needed. As is evidenced today, the experiment worked, and the result is the National Historic Landmark we now call home. Perhaps it’s time for Village organizations to begin planning a Centennial celebration in April, 2023.